Dragonfly felt right at home when we stopped in Henry, Illinois, this morning. This small town's claim to fame? It's the site of the first lock and dam ever constructed on the Illinois River, back in 1870. Today, other dams have superceded this one. You can enter the former lock, because its crumbling limestone walls surround the gas dock of the town marina. We had made an early start, after a blustery night tied to the town dock in Hennepin . 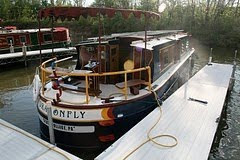 . . the "dock" being an old steel barge that had been rammed up on the riverbank and filled with earth. Across the river, a grain silo made groaning noises all night long, and in the morning we discovered the wind had deposited a thick layer of dirt and twigs on our roof and decks. Boosters started trying to get funding for the construction of this canal back in 1834--the height of the great era of canal construction. The idea was to reduce the travel distance between Chicago and Rock Island. But the state would not fund it; by the time federal funding was organized, it was the 1890s. The canal didn't open till 1907. 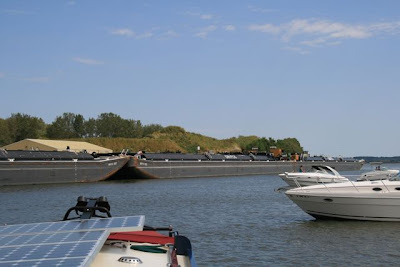 So while the I & M Canal, which we toured back in Ottawa, made a huge impact on commerce, the Hennepin was built too late to really do what it was intended to do. 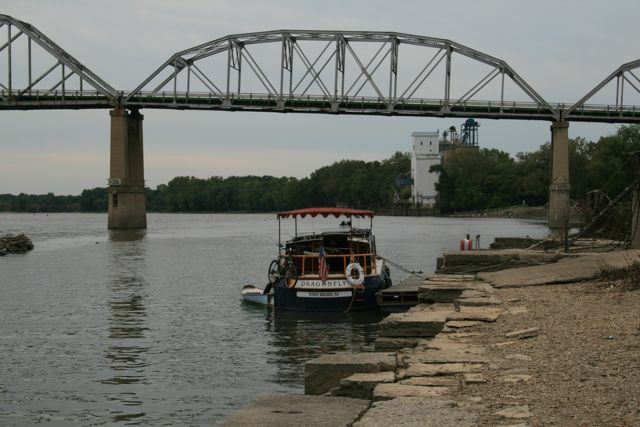 Railroads and barge traffic on the Illinois River already handled most of the local freight. 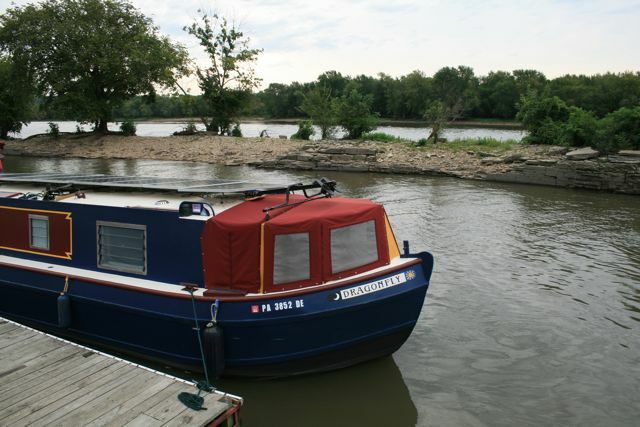 Today, like the Erie and the I & M, the Hennepin Canal is a recreation destination. One other interesting point about this canal: It was the first AMERICAN canal built of concrete. (Previously, all canals had used cut stone to face the locks.) Back in Canada, on the Trent-Severn Waterway, we had learned that the Peterborough Lift Lock, opened around the same time as the Hennepin, also made what was at the time revolutionary use of a building material we now take for granted. 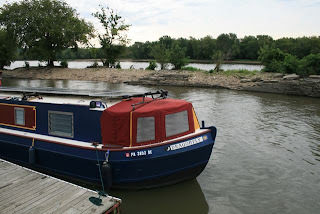 Besides our canal sightseeing yesterday, we took 5 hours (yup, you read that right) to transit a single lock, at Starved Rock, which is just below Ottawa, IL. A lock door had jammed, the electrician was on his way . . . and a couple of big tows had priority over the dozen or so recreational boats buzzing around above the lock. On the Erie and the Trent Severn, if you have to wait till a lock opens, you can tie up on a wall, off to the side . . . but on the Illinois, although there are provisions for barges to tie up and wait, pleasure boats are expected to hang around, burning fossil fuel as they jockey to hold their positions. 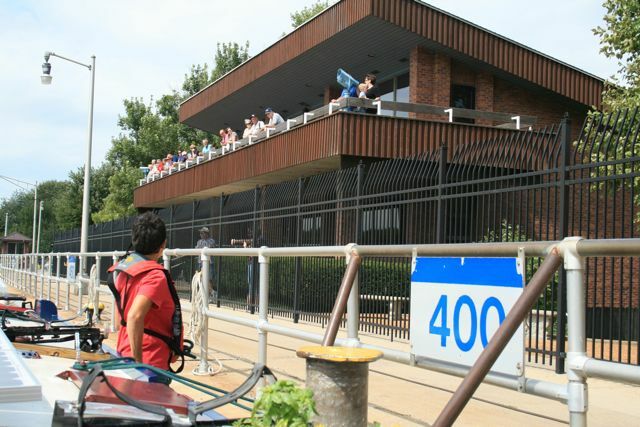 Once we made it into the lock, we had a full gallery of goozlers in the viewing stands by the lock wall . . . augmented by a trolley tour that also rolled by. It's funny to think how many vacation photo albums Dragonfly now graces. make sure you stop by the IVY Club in Peoria, IL on your way south. They are a wonderful host with laundry and eating facilities.